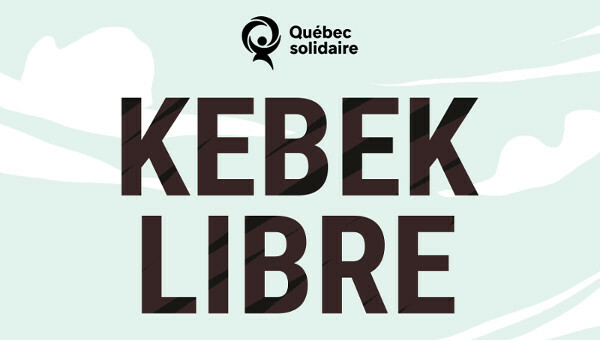 Local and regional bodies of Québec solidaire (QS) are in the process of discussing and taking a first vote on the proposals from the party’s national bodies for its convention to take place at the beginning of May 2013. Political strategy, including the issue of alliances with other parties, as well as the choice of the male spokesperson for the party will undoubtedly be the central points of discussion at the convention. With the possibility anytime of an election call in Quebec,1 pre-convention debates must take into account the party’s stagnating poll numbers. Poll numbers are sitting around nine per cent. But taking into account ‘strategic voting’ pressures amplified by the first-past-the-post voting system, in reality poll numbers are similar to those at the outset of the 2012 election, or a little more than six per cent. QS does not seem able to benefit from the Parti québécois (PQ) governance that is clearly to the right of that party’s electoral platform. And now it is challenged by the rise of Option nationale (ON). 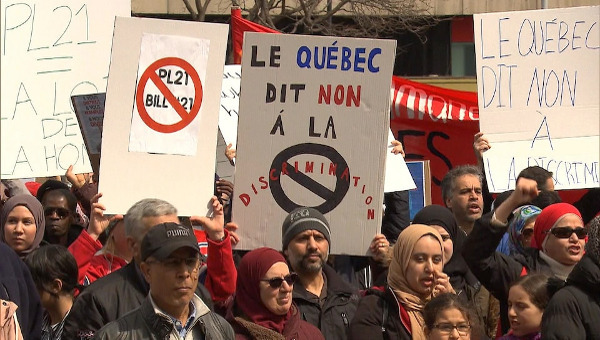 Although the latter has no elected member of the Quebec National Assembly (MNA), one thousand people attended its recent convention. To better understand the debates within Québec solidaire – which have nothing in common with those invented by Presse-toi-à-gauche 2 to salvage a dead-end constituent assembly strategy – we’ll rely, though not exclusively, on the very real and rich debates of the general assembly (in March) of the QS membership in the Hochelaga-Maisonneuve electoral district [in east-end Montreal]. It is considered a winnable district and it has the third largest number of party members after Mercier and Gouin, the two electoral districts that elected QS MNAs last year. The four candidates for male spokesperson were each invited to make a presentation. This fell through when only one accepted the invitation – Alexandre Leduc, the chosen candidate of the district for the next election. But if we base ourselves on blogs and web presentations, there are two candidates for the position who stand out – Leduc and Andrès Fontecilla. The former is a union staff person and presents himself as the youth candidate, emphasizing Quebec sovereignty and electoral growth for the party. The latter emphasizes the importance of internal party democracy and political campaigns. His background is in international solidarity and community organizing. I have a certain discomfort not shared by my colleagues at the general assembly. 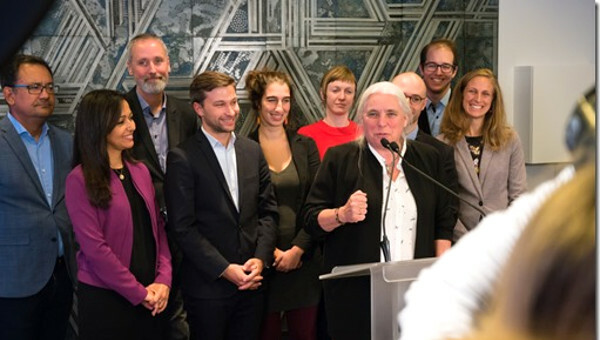 Namely, the two leading candidates for male spokesperson of the party are also candidates in two priority electoral districts – Hochelaga-Maisonneuve and Laurier-Dorion. In my opinion, the president of the party, who is also one of its two spokespeople but cannot run for office, should be focused on building the party, especially the “party of the streets” side of Québec solidaire. This person should be perceived by the public as having a position equal to the MNA-spokespeople. This would avoid having to start over with the position should the non-elected spokesperson be elected as a MNA and this would especially avoid the impression that the position of non-elected spokesperson (and president) merely serves as a stepping stone to the National Assembly. Objections to this were voiced, of a pragmatic and electoralist character, saying the new non-MNA spokesperson, as a full-time employee, will have the time to campaign for election. And so much the better if his/her function as spokesperson provides more visibility. At this stage of development of the party, the argument goes, we need more MNAs. Sure, in the end, we always need more MNAs to win the majority at the National Assembly. But we also never have enough time to build a party of the streets. It’s not enough to have a good mobilization committee, a newspaper and a regular production of leaflets. As much for elections, we need to restructure the party for the purpose of connecting to the social movements, creating horizontal communication and a culture of debate, decentralizing decision-making as much as possible, and asserting tighter supervision of the national leadership by the party base. Is it enough, however, to reject an alliance with the neoliberal parties, sovereignists or not, and to substitute for that an alliance with the labour and popular movements to reshape the party to act in synergy with the social movements? Is it not contradictory to have a great organization to articulate the aspirations of the social movements but which merely smoothes out neoliberal policies to end up with an electoral position hardly different from the PQ and ON3 and, after the election, downplays the few anti-neoliberal planks in its platform?4 In these times of social polarization, an economic crisis strangling Europe and spreading out from there, and an intensifying ecological crisis which multiplies weather extremes, left-leaning people are increasingly looking for a break from neoliberalism, if not from capitalism. They are looking for an alternative party, not just the kind of lesser evil parties like the PQ now in power (or Option nationale in its place), the NDP in power in Manitoba and Nova Scotia (or as the party would govern in Ottawa), or the Socialist Party in France (and the former governments of the PSOE in Spain and PASOK in Greece). Even neoliberal parties have understood the need for marketing campaigns (to deflect attention from the fact they don’t offer meaningful alternatives). The Liberals have their Plan Nord, to expand resource exploitation in the north of the province; the Coalition avenir Québec is testing out its Plan St. Laurent; and Option nationale offers Quebec independence. Even the PQ has a variant – sovereignist governance and energy independence. In the last election, Québec solidaire offered “Stand up” for five main demands. These were: for a country (but the PQ already claims that ground); electrified public transit (another position shared with the PQ); for developing Quebec’s natural resources (ditto); retirement with dignity (ditto); and free education (they nailed that one, at least). What about the QS proposal for a constituent assembly in which the party would defend the sovereignty option? A people does not go into political motion for such a vague or vacuous perspective. The peoples of Venezuela and Bolivia rose up for their second independence against imperialism on a program to nationalize their important natural resources, to radically redistribute income and to free their majority peoples of colour and of indigenous origin. Their constituent assemblies then codified all this, albeit rather poorly and stopping short. The continual softening of a program at least partially anti-neoliberal can lead to one like the NDP’s that conceded almost everything to the market and occupies the same neoliberal policy space as the other parties. We say we are against privatization, but then speak in favour of small and medium businesses. That opens a slippery slope to supporting private daycares and subsidies to private companies for environmental objectives and exploitation of resources. 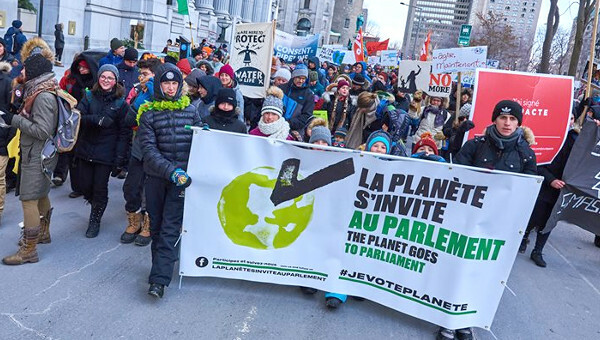 We call ourselves ecologist but no longer oppose drilling for oil in the Gulf of St. Lawrence (I await a criticism of this position by the new ecosocialist collective in QS). We are against poverty but in favour of a social economy, that is, an economy of the poor, for the poor, and paying the wages of the poor. We are feminist but in favour of the ‘domestic economy,’ that is to say, of domestic slavery. This is a translation and slight modification of the original article published in French on the author’s blog, March 29, 2013. Following the provincial election on September 4, 2012, the Parti québécois formed a minority government dependent on votes or abstentions from the Liberal or Coalition avenir Québec parties in order to adopt legislation. Presse-toi-à-gauche (Move Left) is a weekly, online news publication. See my article on this subject (in French): “The urgency of getting the Quebec solidaire’s campaign out of a PQ rut,” Presse-toi-à gauche , June 8, 2012. See my article: “Québec Solidaire fails to oppose oil extraction,” at www.marcbonhomme.com, March 26, 2013. Georges Danton was a radical, leading figure in the early stages of the French Revolution that began in 1789. 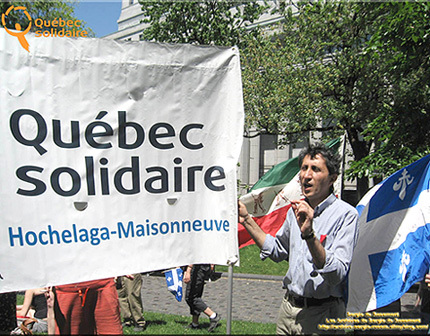 Québec solidaire was founded in 2006. Marc Bonhomme is an economist and member of Québec solidaire.